​Everything you need to pass your exam. Free Practice Exam - with questions formatted exactly like the real exam. Free Study Guide - ensuring you focus on the most important topics. Free Chapter - access to the entire chapter one of the course. 10 Steps To Pass - our 10 step process to study, focus on the most difficult topics, and pass. Other resources - free access to other resources including our breakdown of the most important topics and most difficult part of the exam. IMPORTANT TOPICS - a section for each chapter to review important topics of the CPCU® 557 exam. 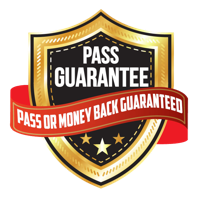 ​MONEY BACK GUARANTEE - pass with our Comprehensive Course or your full money back, guaranteed. The CPCU® 557 is the seventh CPCU® exam in a series of eight required exams to complete your CPCU® designation. This exam consists of 85 multiple choice questions broken up into two sections, part A and part B. For more info about what to expect on the exam, see our blog about the CPCU® 557 Exam Overview. This exam is tough because there is so much content to memorize. In particular, there are a ton of different insurance products and coverages that you need to memorize. 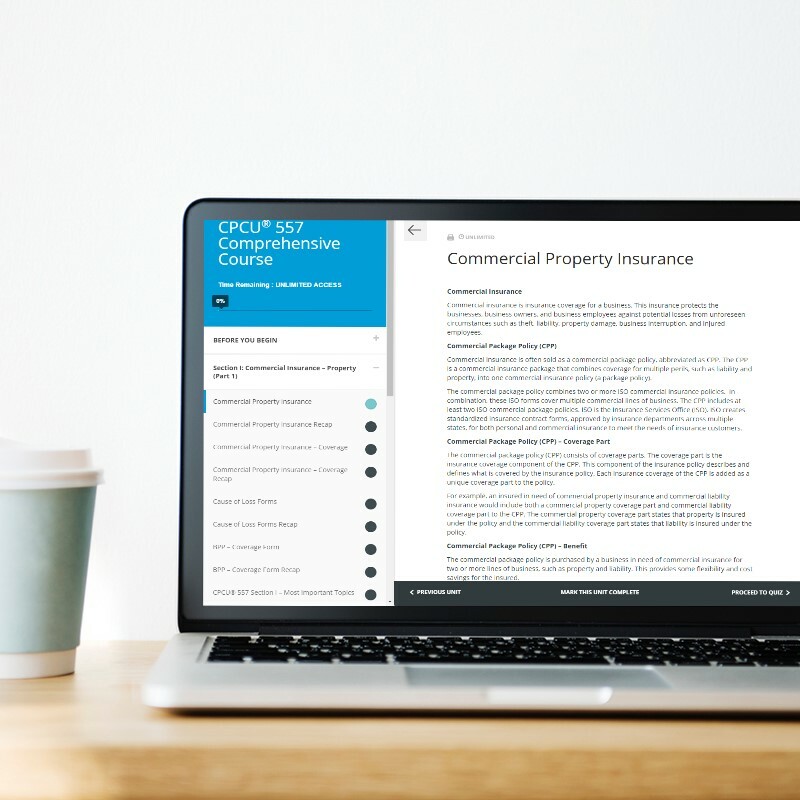 We have personally reviewed the content and counted over 20 different commercial insurance products (such as commercial auto, commercial crime, cyber risk, and employer’s liability) that you need to be familiar with for this exam. Almost every single question on the CPCU® 557 exam will be based on some type of coverage, exclusion, or endorsement. For comparison purposes, this exam is most similar to the CPCU® 555 exam (except this one is based on commercial insurance). 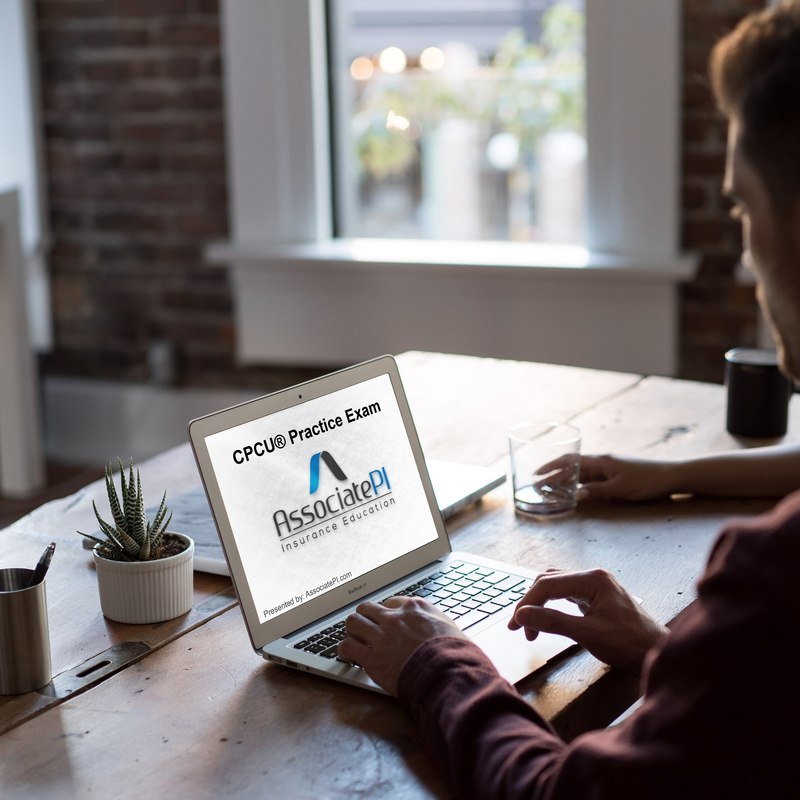 Much like the CPCU® 555 exam, for the CPCU® 557 exam you will be required to memorize every aspect of each insurance product including the coverages, conditions, exclusions, and endorsements. In total, there are over 20 commercial insurance products that you need to memorize to pass this exam. The hardest part of the CPCU® 557 will be memorizing each coverage, condition, exclusion, and every minor aspect of each commercial insurance product. The reason people fail this exam is because they underestimate the amount of content. There is a LOT to memorize. For each commercial insurance product, such as the commercial general liability policy (one of the most important topics of the 557 exam), you must know the insurance limit, covered losses, optional coverages, additional coverages, coverage extensions, loss conditions, coverage conditions, exclusions, and endorsements. You have to know this for EACH of the 20 commercial insurance products covered in this exam (that’s a lot to memorize). For more insight, see our blog about the CPCU® 557 Difficulty. ​For more info about the most important topics see our blog about the CPCU® 557 Exam Topics. The exam is tricky. The multiple choice questions will try to trick you by mixing the optional coverages, loss conditions, and insurance limits of the various products. Pay close attention to the minor details of each commercial insurance product. You must be able to confidently state the coverages, conditions, and exclusions of each insurance product covered in the study material. We recommend you focus first on memorizing the definition of the insurance product and coverage. Then memorize the minor details and differences between each different insurance product. The 557 will try to trick you by asking about the minor differences between products. The exam will even makeup the name of a commercial insurance form to try and trick you! 1) Study each chapter: Treat each chapter like its own textbook. Read each chapter and memorize the insurance products and coverages as you go. Don’t wait until the end to memorize the coverages, exclusions, and conditions. You will be overwhelmed. 3) Practice, practice, practice: Take as many practice exam and quizzes as you possibly can. This will help you familiarize yourself with the CPCU® 557 question format and help you determine which topics you need to re-study. Once you go through a few practice quizzes and exams, return to your notes and review any section that you failed. For more information about the type of questions you will see on the exam see our blog about the CPCU® 557 Exam Questions. Here’s all eight videos to our CPCU® 557 four -part video series, covering everything you need to know to prepare for your CPCU® 557 exam.